British Gas customers are facing higher fuel bills after the company said gas and electricity prices would rise 14%. The firm will increase residential charges across the UK from 19 September, blaming rising oil prices and shrinking domestic gas reserves. British Gas said it would offer a £60 rebate to 250,000 low-income customers to help them pay bills over the winter. Rivals Powergen and EDF Energy have also recently announced price rises as commodity prices surged to records. 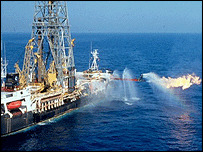 British Gas, which is part of the Centrica group, warned in June that prices may have to rise. 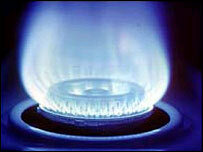 The forthcoming price rises will apply to all British Gas and Scottish Gas customers. Soaring crude oil prices - which surged above $70 a barrel in the wake of Hurricane Katrina - and dwindling North Sea reserves have made wholesale prices more expensive, British Gas said on Friday. Wholesale gas prices have been 50% higher than a year ago, while electricity prices have gone up 61% over the past year, and the markets are expecting them to rise further. "We are no longer an energy island - spiralling world oil prices are now having an unprecedented impact on the cost of gas as the UK is now dependent on imports," said British Gas managing director Mark Clare. The £60 rebate will be paid in two instalments, in November and February 2006, the company said, adding that the discount would offset the price rises for the most vulnerable customers. Powergen and EDF Energy have both increased their fuel tariffs in recent weeks. Powergen increased electricity and gas prices by 7% and 12% respectively while EDF Energy upped theirs by 10% and 12%. According to consumer watchdog Energywatch, domestic gas and electricity prices rose by 21% and 17% respectively in the 18 months to August. British Gas put up its prices twice last year, prompting more than 900,000 customers to swap suppliers. Price comparison firm uSwitch said the price increase would hit customers hard. "There's no doubt today's price rise by British Gas will come as a real blow to customers, particularly those who have already paid the price for remaining loyal to them following last year's record hikes," said Alan Tattersall, uSwitch's director of home services.